Our lawn has become unsightly due to mole populations. 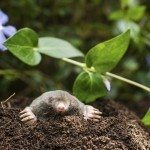 We have used repellents specifically for mole control at Home Depot. That has not worked. This year we tried a granular application for insect control in order to eliminate the source of food. We have only applied once so far, but the tunnels have increased. We do not have an irrigation system, so I do not believe over-watering is an issue. Do you have any other suggestions?